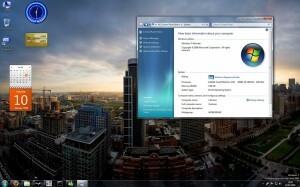 Want to navigate Windows 7 faster, with less hassle? Now you can, with this list of Windows 7 shortcuts. ALT + Tab: Allows you to switch between multiple windows. Hold down ALT, press Tab, until you locate the window you want. Release and the window will be pulled to the front, as the active window. CTRL + Period (. ): Rotates a picture clockwise. CTRL + Comma (,): Rotates a picture counter-clockwise. CTRL + SHIFT + ESC: Opens Windows Task Manager. CTRL + SHIFT + N: Creates a new folder. CTRL + SHIFT + Click: Runs program as Administrator. SHIFT (5 times): Turns on / off Sticky Keys, which is a feature that lets you press SHIFT, CTRL, ALT, or the Windows keys key one at a time, instead of having to hold down several keys at once. Great for people with a handicap and/or accessibility issues. SHIFT + Right Click (on a file): Gives you an enhanced Send To menu, so that you have more options and locations to “send to”. SHIFT + Right Click (on a folder): Gives you an option to open a command prompt. SHIFT + Click (on a taskbar item): Opens a new instance of that application. WIN + D: Shows desktop by minimizing all active windows. Win + Down Arrow: Minimizes the active window. Win + Up Arrow: Maximizes the active window. Win + Left or Right Arrows: Moves the active window to the left or right side of the screen. Win + Home: Clears all windows but the active window. (For Dual Monitors) Win + SHIFT + Left or Right Arrow: Moves active window to the left or right monitor. Win + L: Locks PC, allows you to switch users. Win + Plus Sign (+) or Minus Sign (-): Zooms in or out on screen. Great for small text on webpages, or checking out something small in a photo. Win + F: Search for files or folders. Win + F1: Brings up the Windows help menu. Win + G: Cycles between Windows Gadgets on desktop. Win + R: Opens the run dialog box. Win + E: Opens Windows Explorer. Great for quickly browsing to network file folders. Win + Space: Previews the desktop. Win + T: Selects task bar items, use your arrows to flip through to the task bar item you want to use. Win +1, Win +2, Win +3…: Quickly opens task bar items. The first item is the item closest to the start button. Win + P: Connect a laptop to a projector or screen. Win + Pause: Opens the System Properties window.